It's Monday and that means a brand new sketch to inspire you over at Let's Get Sketchy! Once again, I've used the CTMH Chantilly collection and coordinating Chantilly Chipboard accents (can you tell it is one of my faves!!). Title was cut with my Cricut. I do hope you'll come visit me and the rest of the Let's Get Sketchy team & play along with us this month! You have a chance to be featured on our blog and to win a great scrappy prize! Beautiful page, I love the colors and the flowers! So pretty Carla! I love your patterned paper choices. You did an awesome job with the sketch! I love what you did with the sketch Carla..and I adore all the journaling strips. Lovely take on the sketch Carla. That paper collection is really cute! 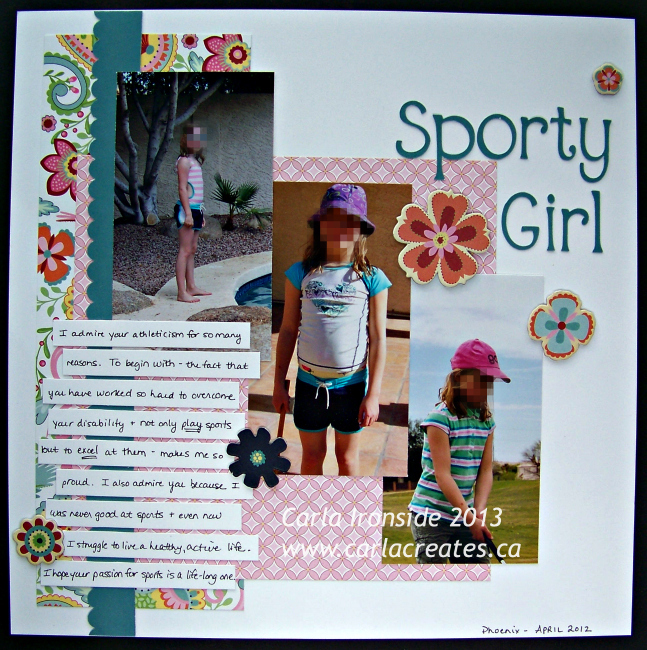 I also may steal your title :) I have a sporty girl (or three) in my house and I've been pondering a similar layout lately but was missing something to tie it all together. Thanks for the inspiration!